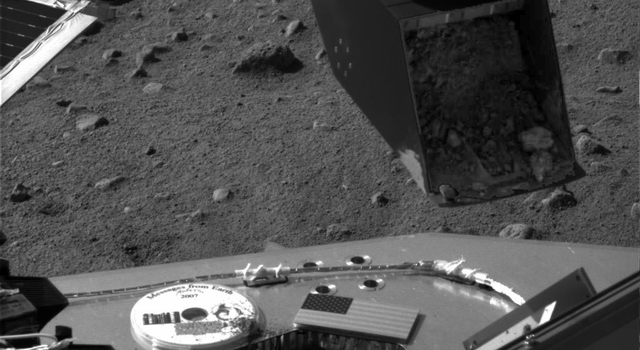 TUCSON, Ariz. -- A microscope on NASA's Mars Phoenix Lander has taken images of dust and sand particles with the greatest resolution ever returned from another planet. The mission's Optical Microscope observed particles that had fallen onto an exposed surface, revealing grains as small as one-tenth the diameter of a human hair. "We have images showing the diversity of mineralogy on Mars at a scale that is unprecedented in planetary exploration," said Michael Hecht of NASA's Jet Propulsion Laboratory, Pasadena. He is the lead scientist for Phoenix's Microscopy, Electrochemistry and Conductivity Analyzer (MECA) instrument suite. Meanwhile, Phoenix received commands Thursday to collect its first soil sample to be delivered to a laboratory instrument on the lander deck. Commands for that same activity sent on Wednesday did not reach Phoenix because the orbiter intended for relaying the transmission, NASA's Mars Odyssey, had put itself into a safe standby mode shortly before the commands would have reached Odyssey. 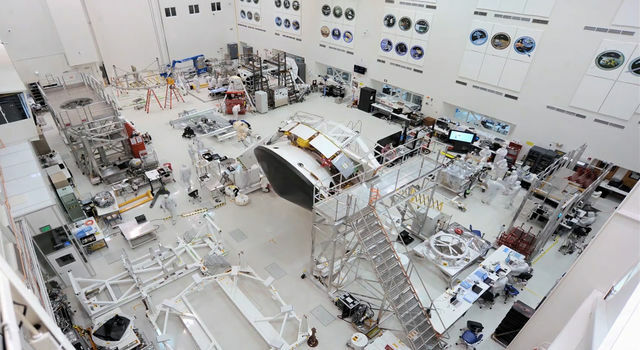 On Wednesday, the lander completed a back-up plan of activities that had been sent previously, reported JPL's Chris Lewicki, mission manager for Phoenix surface operations on the lander's 11th Martian day. That plan included weather monitoring and additional imaging for a high-resolution color panorama of the site. The Optical Microscope images were taken June 3 of particles that had collected on a sticky surface exposed during the Phoenix landing and for five days after landing. "It's a first quick look," Hecht said. "This experiment was partly an insurance policy for something to observe with the microscope before getting a soil sample delivered by the arm, and partly a characterization of the Optical Microscope. All the tools are working well." 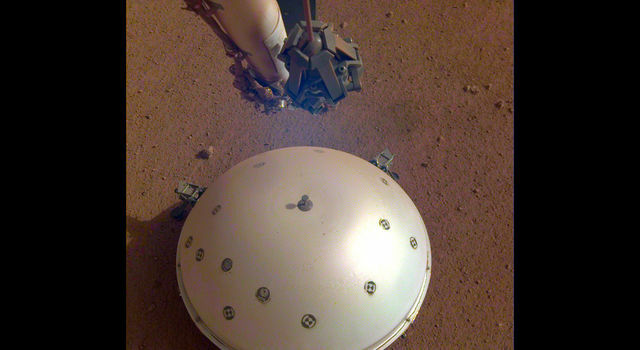 Some of the particles might have come from inside the spacecraft during the forceful events of landing, but many match expectations for Martian particles. 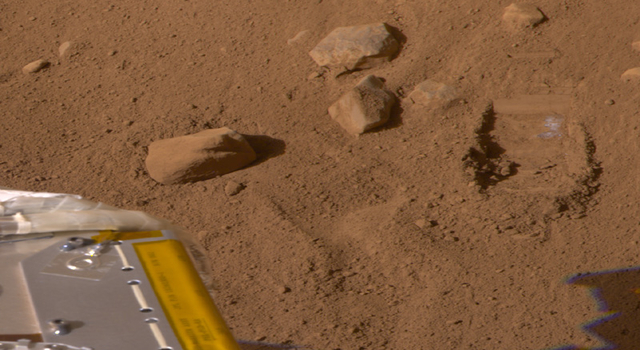 "We will be using future observations of soil samples delivered by the Robotic Arm to confirm whether the types of particles in this dustfall sample are also seen in samples we can be certain are Martian in origin," Hecht said. 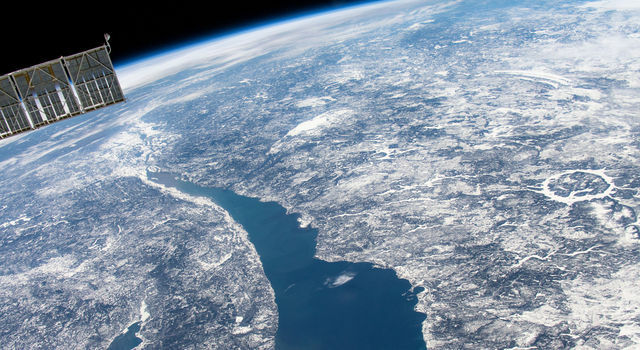 "You can see the amount of variety there is in what appears otherwise to be just reddish brown soil," said Tom Pike, Phoenix science team member from Imperial College London. He noted that one translucent particle resembles a grain of salt, but that it is too early to say for sure. Thursday's commands were relayed to Phoenix via NASA's Mars Reconnaissance Orbiter. The relay radio on that orbiter has been working well in recent days, after intermittently turning itself off last week. Phoenix will continue to do relays via Mars Reconnaissance Orbiter until Odyssey returns to full functioning, and then Phoenix will use both orbiters. "We are currently bringing the Odyssey spacecraft back into nominal operations, and we will resume relay service with Odyssey in the next day or two," said JPL's Chad Edwards, chief telecommunications engineer for the JPL Mars Exploration Program. "We think Odyssey went into safe mode because of a single event that affected computer memory," Edwards said. "Yesterday's safe mode event appears to be very similar to events that have caused Odyssey to go into safe mode two or three times earlier during its long operation around Mars." Odyssey has been orbiting Mars since 2001.